Last week, in Sydney, a tent for rent was posted in a Facebook group Inner West Housemates a forum for anyone searching for a place to live in Sydney’s inner western suburbs. The post also asks whoever rents the tent to be willing to take on cleaning responsibilities in the house along with contributing $200 bond. 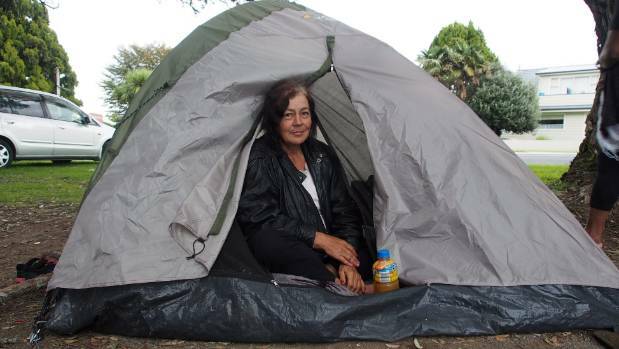 Closer to home, in Tauranga Sheree Galautau had been sleeping under the stars, but one morning she woke up and someone had left her a tent. “I just woke up and the tent was just left there for me,” says. It was a welcome step up. Moving across the road and into Silver Birch and living in a caravan seems like moving to Beverly Hills. The grass is greener over there – they have water, power, people and an alluring escape from the judgements that come about homelessness, writes Matt Shand in the Sunday Star Times. Occasionally, Galautau crosses the busy road to talk to the manager. There is no room for long term dwellers – there never is. “I probably get between five to ten calls a day from people unable to find a place to live looking for some options.” says he owner of Silver Birch, Tony Makai. Any way because Sheree earns just $306 a week, living in a caravan would be a bit of a stretch. It costs between $30 and $150 a week to rent a caravan from a company but placing one in a powered site will cost at least $210 a week.